This article originally appeared on The Trek, which you can find here. The original post includes our gear video, check it out! 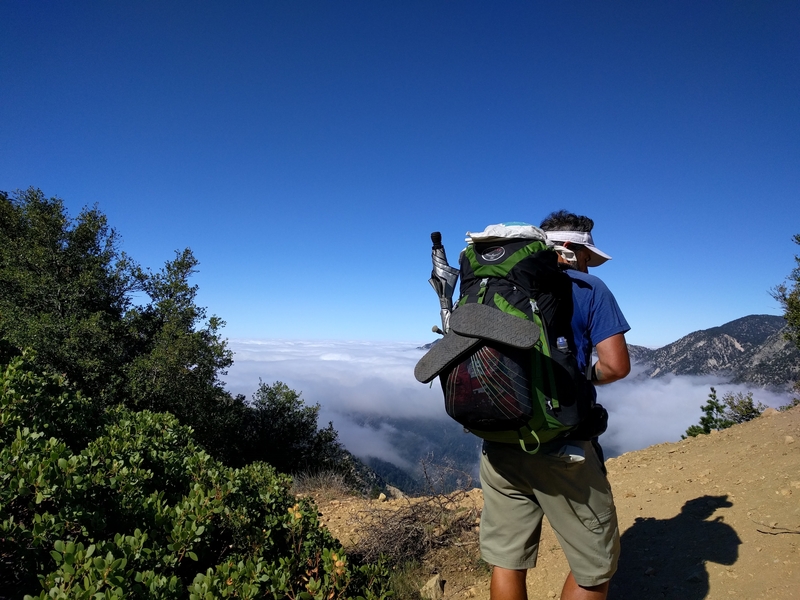 Before we took off on the PCT this year, we felt that our gear was pretty dialed. 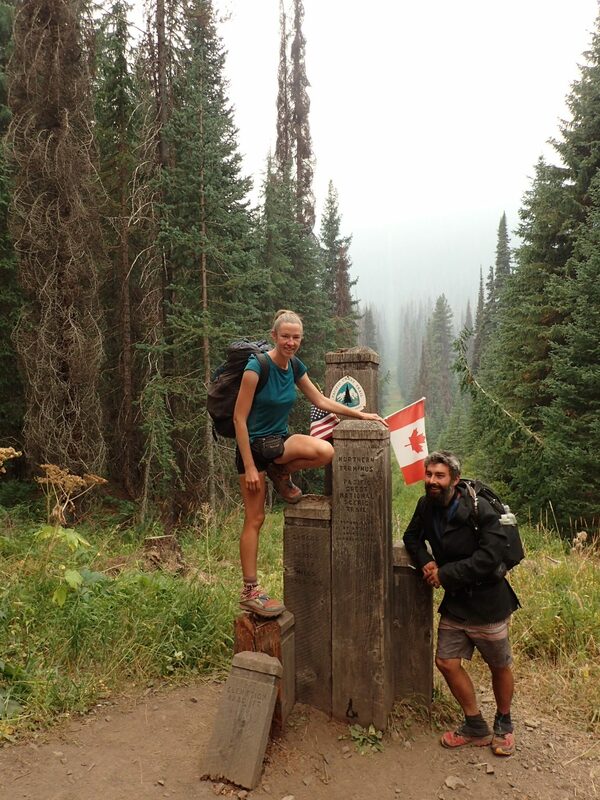 We learned a lot about ourselves and our preferences while on the AT last year, and we did quite a bit of tweaking to our setup to reduce our base weight as much as possible before starting the PCT. 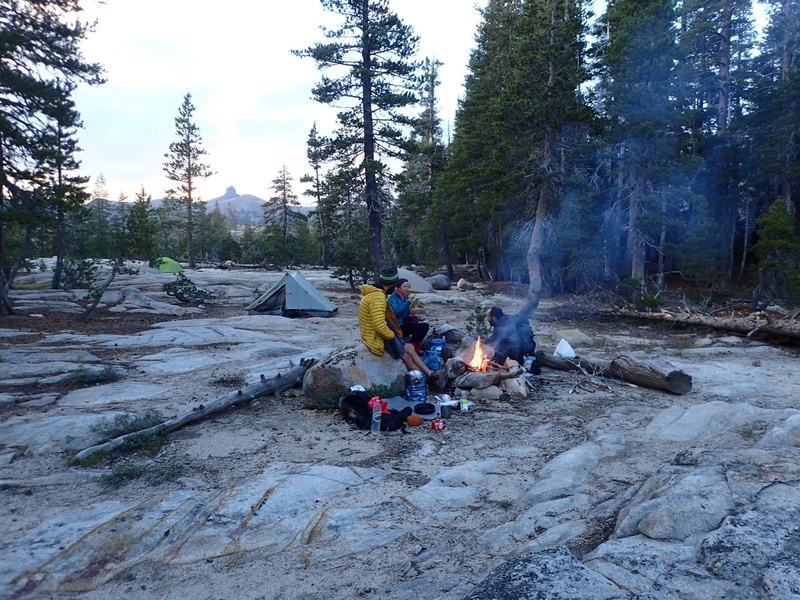 Still, the PCT is a different animal than the AT. We quickly learned we’d still have to make some adjustments along the way, and we learned a little more about our needs and preferences as well. We started and ended with a lightweight setup. We’re flirting with ultralight, but I think we aren’t quite there yet. We are lucky because as a couple we get to share gear and eliminate a lot more redundancies. There are a few items we learned maybe we went a little too ultralight (such as our rain jackets) but even so our gear performed and survived for the most part. Although we might make some different choices in the future, we didn’t have to make any major gear purchases while on trail. Pretty much all of our core gear survived, and performed well. Only our trekking poles succumbed to the trail, and each pair had already completed the entire AT. Piñata replaced his with some orphan poles from hiker boxes. I broke one pole and opted to continue on with just one and found it worked well for me. 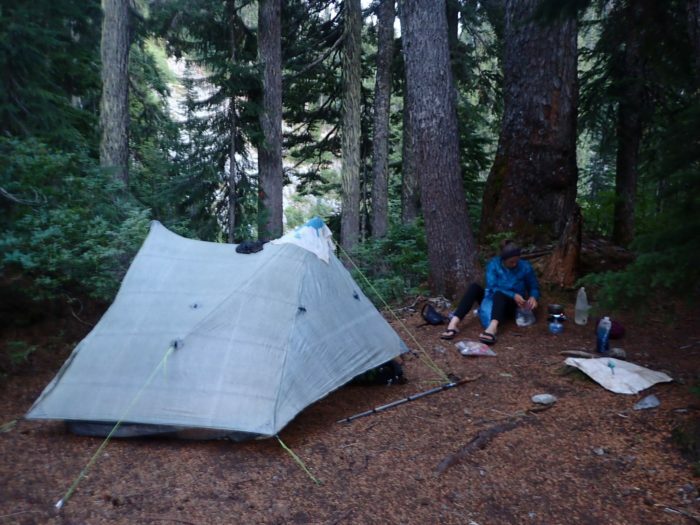 Our tent has stood up through 1,700 AT miles and the entire PCT. During the final days of the hike we began to have zipper problems, so we will be sending the tent in for repair. Hopefully we can get another long trail out of it. We loved the quilt and double sleeping pad combination. Having a 2 person quilt saves a ton of weight and works really well for a summer thru-hike. Despite many nights below freezing, we stayed comfortable. Having a nice warm pad for 2, rather than trying to lash 2 pads together makes a big difference. I never felt cold from below. I also discovered I sleep much better on the inflatable pad than the self-inflating style. How did I do the entire AT on a Prolite? I guess I just didn’t know what I was missing! 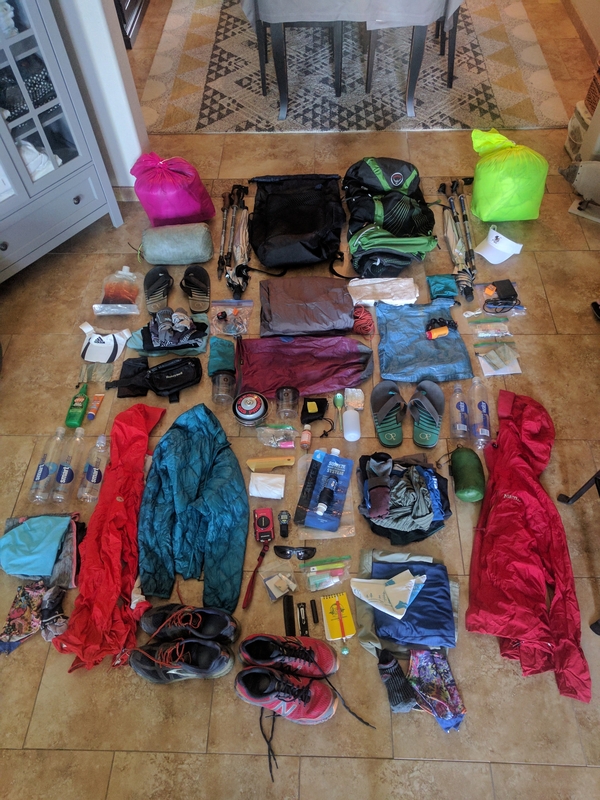 Piñata’s pack made it through the entire PCT in addition to the last 500 miles of the AT last year. It’s definitely pretty worn out now, but still fully functional. My pack held up amazing. I was worried that homemade gear wouldn’t hold up as well, especially because I have a pretty basic sewing machine, but the design of the pack is really great. I think my pack held up better than most, and next time I’d choose a slightly lower volume. On the plus side, I could fit the BV500 bear canister inside the pack without too much difficulty. While we did ditch a few things, our kitchen was relatively unchanged. Our stove has made it through 2 thru-hikes and is still going strong. Our pot worked fine, but next time we’ll take a 1L pot. Piñata ditched his Talenti jar because one was enough to cold-hydrate food. After the desert we lowered our water carrying capacity. By the end we could carry 5 liters total. The plastic nalgene for olive oil is one of the best things we carry, and we add oil to every meal. The syringe to backflush the Sawyer can be found in most hiker boxes. Use in town and replace for the next hiker. The cap from a Smart Water or Life Water can also fit on the filter for backflushing. An empty lighter will still light your stove. All you need is the spark. Phones: 2 Nexus 5x phones, with ear buds, Guthook, etc. We sent the umbrellas home after the desert. I would carry one again, Piñata would not. I brought Athletes foot cream preemptively on the PCT due to my experience on the AT, and I never once used it on the PCT, it’s just a much drier trail. The headlamps were super light, and worked well for cooking dinner or reading in the tent, but they are not suitable for night hiking. We don’t usually night hike, but it would be nice to have the option. We’ll probably go back to the heavier lights next time just for the versatility. During the snowbound portion of the hike we carried an extra power pack from a hiker box, because the constant navigation can really drain the batteries. For the rest of the hike our power pack worked great. Piñata sent home his wool tee shirt along with his umbrella and opted for a lightweight long sleeve shirt for hiking in the sun. He also sent home the wool boxers. He traded the visor for a trucker cap, and got a new pair of shorts after the first one wore out. I stopped using the visor at some point, maybe around Oregon, but I still carried it the rest of the way. I sent the bandana home. I swapped my nasty hiking clothes for a new set around Ashland. In a foolish effort to cut some weight I started the trail with lightweight running socks from Darn Tough instead of the heavier hiking socks. By day 4 I realized I’d made a bad choice. I went back to my old setup – 2 pairs of Darn Tough hiking socks to switch out, and a heavy pair of cheaper wool socks to sleep in, because I like my feet warm at night. Both of us regretted not having our gloves during the first week, as we got snowed on. We had already sent them to Kennedy Meadows. When the weather got cold in September, I added a fleece top and we both added our rain pants in addition to the gloves. On a couple nights I wore all of my layers. 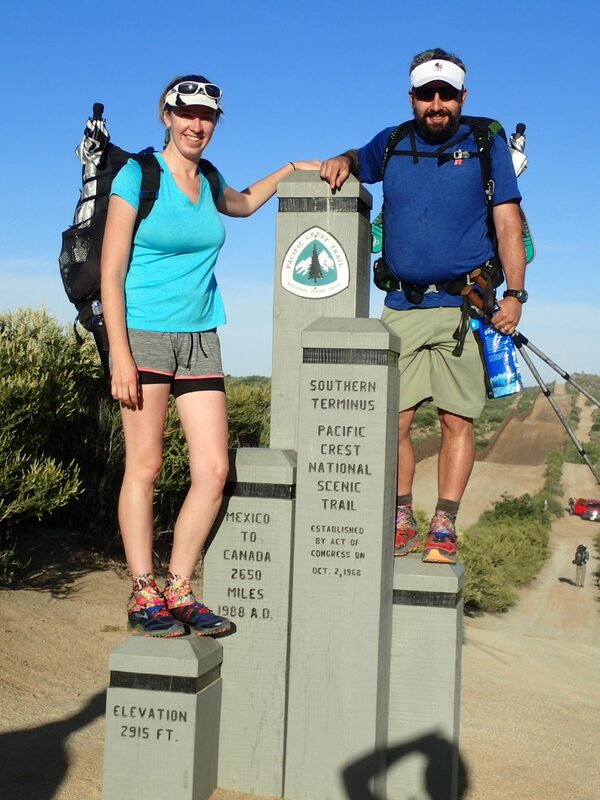 Both of our jackets completed both the AT and PCT. They served us well, but we would make different choices if we were to do it again. I’d get a slightly thicker puffy jacket with a hood. The extra warmth would be nice and the hood would do well with the quilt sleeping system. 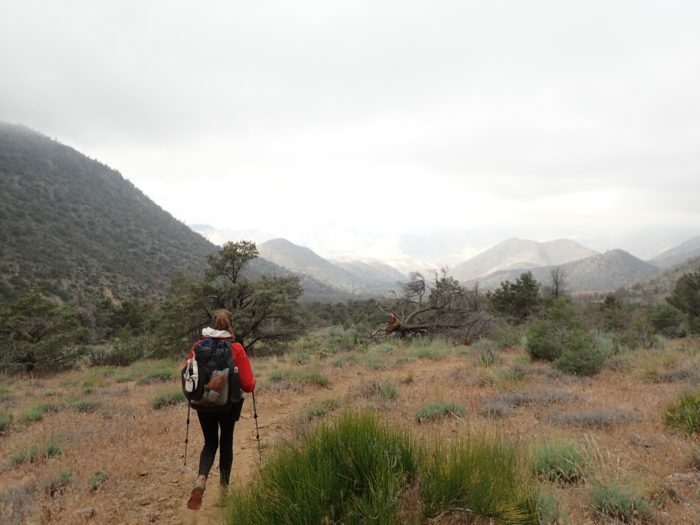 Our rain shells were basically just a wind shell/extra layer on the PCT. We only got truly rained on once, and were saturated and leaking within just minutes. To be fair, these jackets had already stood up through tons of rain on the AT. We were just stretching a little extra life out of them. Don’t spend a lot of money on your hiking clothes. They won’t survive beyond the trail and you can get polyester gear for super cheap at Target or Walmart. I got my shirt and shorts from Target before starting for $15. I replaced them both in Ashland at Walmart for a couple dollars less. That’s 2 full outfits for the cost of a single Under Armour shirt. Darn Tough socks have a guarantee, and if they get holes you can swap them for a new pair at many outfitters along the trail. I’ve gotten several pairs of Darn Toughs from hiker boxes, worn them out and traded for a new pair. Why would anyone throw them out? Piñata wore 4 pairs of Leadvilles and he loves them, particularly because he has wide feet. I wore 3 pairs of Cascadias and then tried out the Altra Lone Peaks. Both were comfortable, but the Lone Peaks are a bit roomier and cushier. Unfortunately they offer a little less support than the Cascadias and fall apart even faster. I’ll probably try out another shoe next time. Both of our Dirty Girls got a lot of holes. I sewed them up until they just wouldn’t stay together anymore. Piñata got a pair of Outdoor Research gaiters for a replacement and regretted it. They are designed for pretty wide ankles and slid down on his. I finished the last few hundred miles without gaiters just because I didn’t want to spend another $20. I did notice a lot more dirt and rocks in my shoes, so I think the gaiters are worth it in the long run, but I did just fine without them. We started carrying a shoe-glue called FreeSole for shoe repairs and it really helped us stretch out the lives of our shoes. I used it preventatively on the areas prone to tearing and found my shoes held up much better than most. Get the old model shoe. Trail runners are typically updated every year, and typically cost around $130. If you seek out the old version, you’ll find it on sale nearly everywhere. We got our shoes for $60-$80 each. The Sierra section of trail is unique in that some extra gear is required. All hikers are required to carry a bear canister. During high snowpack an ice axe and microspikes are important safety tools. Some extra layers are helpful if the nights will be cold. We carried a BV500 and a Backpacker’s Cache, both of which work equally well but are shaped slightly differently. We carried Black Diamond RavenPro and Petzl Glacier ice axes. Both worked well, but for a thru-hike in the future I’d just go with the Camp Corsa and save the weight. It works fine for thru-hiking needs. We wore Microspikes and Chainsen Pro spikes. They are essentially the same but the fit is slightly different, and both worked equally well. 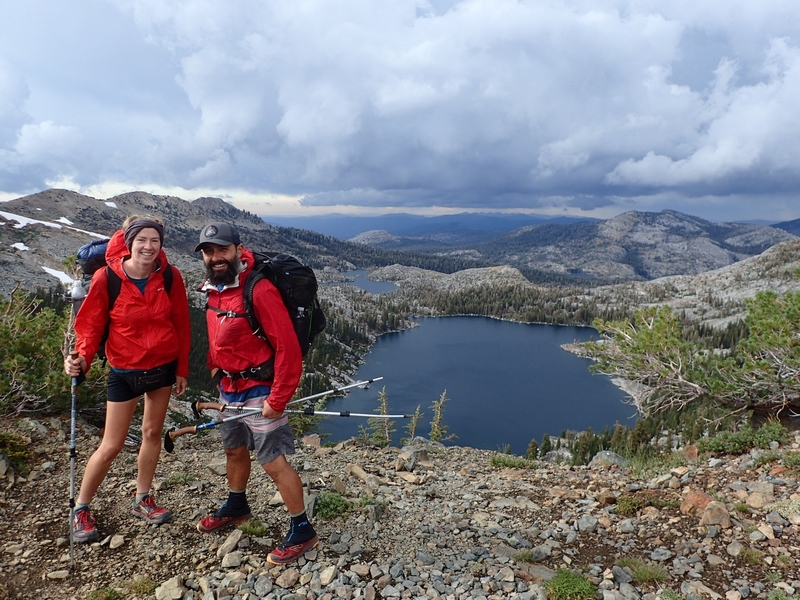 Because our hike was a flip-flop, we did part of the Sierra in June and part in September. In June we used the ice axes and spikes daily. In September we did not bring them, but did add warmer clothing layers- fleece and rain pants. If you don’t have your bear canister yet, save yourself some shipping cost because you can buy one at Kennedy Meadows for the same price. There are also plenty of options for renting bear canisters which may be much easier for an international hiker. Make sure to practice self arrest with your ice axe. We watched plenty of videos on technique ahead of time, and when we started getting into significant snow, we looked for a spot with nice run out and spent several hours practicing. We gained a ton of confidence. I saw some hikers who never used their ice axe because they were afraid of it. It won’t help you if you don’t know how to use it.